It all started back in February when Apple CEO Steve Jobs published his now famous open letter titled ‘Thoughts on Music‘. In it he explained the major labels’ thinking behind their support for Digital Rights Management (DRM), and that it hadn’t worked to stop piracy. Instead, argued Jobs, DRM was harming consumer interests, since, along with other restrictions, music bought from competing stores won’t play on all devices. Many questioned Jobs’ motives for the letter, noting that the iPod/iTunes hegemony had been in part built on the major labels’ insistence on DRM. Music bought from iTunes could only play back on an iPod, and likewise, the only DRM’d music the iPod supports is music sold through iTunes. Was Jobs trying to get the European Union regulators off his back by blaming the record labels for Apple’s near monopoly of the digital music space? Or perhaps he was simply trying to appear ahead of the tide, as he saw an industry-wide move towards DRM-free music as inevitable. Or taken at face value, it was a sincere attempt by Jobs to kick start that move, since a DRM-free world might help to invigorate a stagnating market for digital music downloads — and the iPod was good enough to compete on its own merits without being locked to music purchased from the iTunes Store. A partial answer came two months later when EMI announced it was to offer its entire catalog without DRM, and the first store to sign-on would be iTunes. It seems that Jobs was serious about ditching DRM after all. A sign that things would never quite be the same came in May when Amazon confirmed a long standing rumor that it was to launch its own digital music store, with all tracks offered as a standard MP3 without DRM. At the time we noted that “Amazon’s clout should help pile on more pressure for the other major record labels to follow suit and embrace the MP3 format.” If Amazon could make a respectable dent in the digital music market (and help grow it), then the major labels, desperate to weaken Apple’s position, would see that ditching DRM was a viable way to achieve this. Ten days later, the DRM-free version of iTunes (iTunes Plus) opened for business, followed by a plethora of DRM-free store launches over the next few months: 7digital, Limewire, Wal-Mart, Amazon MP3, Microsoft (Zune), and Deutsche Grammaophon. Universal Music also began experimenting with DRM downloads, starting with gBox, followed by Amazon, RealNetworks, Best Buy and Wal-Mart. Universal’s DRM-free window ends 31st January 2008, when the company plans to review what effect ditching DRM has had on piracy and sales. And just this week, Warner announced that it was to sell DRM-free tracks through Amazon MP3, leaving Sony BMG the only major label yet to begin ditching DRM. Citing the popularity of iTunes Plus, in October Apple slashed the price of DRM-free tracks offered on iTunes, and early reports suggest that Amazon MP3 has also been a huge success (making it the number three digital music store in just one month). It therefore appears that ditching DRM has to some degree achieved the dual aims of invigorating the marketplace for digital music and creating a serious competitor to iTunes. As a result, many are predicting that 2008 will be the year that DRM is ditched completely, as all the major labels come on board, and I think this will be true for traditional music downloads. However, in another context, DRM’d music looks like it’s here to stay for the foreseeable future at least. Subscription-based services still require the use of DRM and may become more acceptable to consumers as broadband becomes ubiquitous, enabling our music collection to “live in the cloud”, accessible anywhere and anytime. There’s been quite a bit of activity in the mobile music space in 2007, with device manufacturers and mobile carriers teaming up with online music services and download stores or launching their own offerings. In May, Pandora launched its ‘anywhere’ platform to enable the music discovery service to reach devices beyond the PC — both mobile and around the home. Sprint was the first carrier to sign-on, resulting in Pandora being offered on five music-enabled handsets. And the following month, iriver announced the launch of the Clix Rhapsody, a version of its portable media player which is optimized to integrate with Real’s subscription-based digital music service. In July, eMusic signed a deal with AT&T Mobile to sell ‘over-the-air’ music downloads to the telco’s millions of mobile phone users. Omniphone partnered with Vodafone UK in September to offer MusicStation, an all-you-can-eat subscription music service. For a small weekly fee, Vodafone customers can access the entire MusicStation catalog which is supported by the four major record labels — the Universal Music Group, Sony BMG, EMI, and Warner. However, perhaps the most significant trend in the mobile music space saw a number of music stores launched or announced by mobile device manufactures in an attempt to compete directly with similar offerings from the mobile carriers with whom they’re forced to partner. Apple launched the iTunes WiFi store, cutting AT&T (and its other mobile partners around the globe) out of any iPhone associated music revenue. 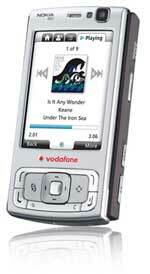 Nokia also launched its own music download store, and Sony Ericsson announced plans to do the same. Next year will see a lot more mobile music activity, particularly as handset makers and carriers attempt to boost non-device and non-voice related revenue to make up for falling profit margins. The major labels also see mobile music as an area where Apple doesn’t yet dominate and one in which they can charge higher prices based on impulse buying and perceived convenience. 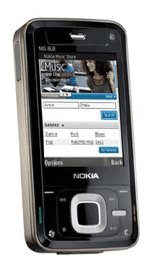 As already noted when we wrote about the launch of Nokia’s music store, developments in 2007 have put mobile carriers and device manufacturers on a potential collision course in 2008. The same might well apply to both Apple and Sony Ericsson. One of the biggest stories of 2007 was Radiohead’s decision to offer their new album for download on a pay-what-you-want basis. While we may never know the true download sales figures (see comScore’s stats and Radiohead’s response), the experiment was a huge success in terms of PR and raising the notion of high profile artists bypassing the need to be signed to a major record label or any label at all (see Madonna and Nine Inch Nails). Perhaps tellingly, however, Radiohead ended the pay-what-you-want offer after two months, in time for the album’s general CD release. Pay-what-you-want wasn’t the only new model tested in 2007, and in a post titled ‘Music industry: five alternative business models‘, we looked at other alternative ways to sell music online including “free”, ad-suported (see our Spiralfrog review), subscriptions, and a music “tax” on devices and broadband services. Next year will likely see more artists strike out on their own, as well as a number of Radiohead copycats. Whether or not the pay-what-you-want model has legs beyond the most popular artists is yet to be seen, although comedian Steve Hofstetter’s experiment looks to be yielding positive results. One model that will be pushed hard in 2008 is the music “tax” idea that’s been banded about for years. Charge the customers of ISPs, cellphone carriers or even device manufacturers a flat-rate fee as part of their data service plan or purchase, in exchange for the right to access and possibly share music from the major record labels’ catalogs. That way, downloading is decriminalized and the recording industry is guaranteed revenue. Universal Music is touting its own version of the idea called Total Music, and has just partnered with Nokia who are offering something similar. Customers who buy a “Comes with music” Nokia device will get a year of unlimited access to “millions of tracks”, and, rather surprisingly, get to keep those tracks once the twelve month period ends. A slight tangent.. but this discussion only considers “digital music” in the context of distribution, media players, and copyright! I know this isn’t pitchfork.. but imagine if we actually stretched our imagination to think about the way that digital technology changed the way we make music. Nah, never mind.. what could be more 2.0 than downloading the newest Norah Jones DRM free! I actually have my own digital studio (and have had for over 10 years) so I know a thing or two about the way music production has/is changing. But it’s not something we have the scope to cover here. This DRM stuff is killing me!!! I do not live in the US anymore so I could care less about the breaking US law and removing DRM for personal use. DRM no DRM…. I just want to be able to play my media on any platform that I choose. DRM is like going into your local stereo shop and having to purchase a DVD player for each movie studio. So now I found a great decission – MelodyCan converter (http://www.melodycan.com/index.php) which helps me to resolve drm-protection problem. Thank you for some other excellent post. The place else could anybody get that type of information in such an ideal means of writing? I’ve a presentation subsequent week, and I’m on the search for such info.